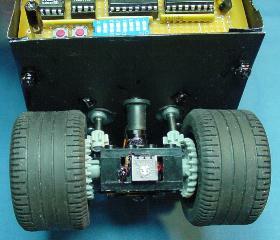 Bugdozer is an autonomous miniature Sumo robot. Because of weight and size limitations, a well-designed body is essential for victory, if not just for simple qualification. I’m a software engineer by training and profession. 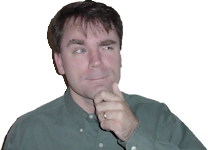 When I decided I wanted to build robots, I was intimidated by the electrical engineering. 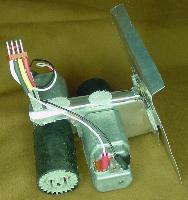 It turned out that the hardest part of creating a solid robot was the mechanical engineering and machining. I began by thinking of desirable forms and shapes as well as potentially effective methods of attack. Then, I’d sketch prototype frames onto thick paper. After drawing on, cutting, and folding the paper, I’d compare space and panels to the components and their mounting points. When a paper model appeared viable, I’d manually copy the design onto thin aluminum flashing with a permanent black marker, using the paper cutout as a stencil. Aluminum flashing is inexpensive and available at any hardware store. Tin snips were used to cut out the shape. Thin aluminum bends easily by hand, and yet holds its shape well enough under light loads. Aluminum sheeting has many benefits. It’s strong for its light weight, easily machined, and acts as a heat sink. On the downside, it’s still a relatively soft metal, so load-bearing portions should be made out of thick pieces or reinforced with a steel frame. I spent many, many weeks experimenting with body shapes, motor sizes, and different wheels. I created three distinct designs with multiple variations. I’m not happy with the center of gravity and inaccessibility of my final design, but it tested far better than the others and I’ve run out of time. Bugdozer’s underbody is made of LEGO bricks with circuit boards attached. LEGOs are high precision, expertly designed, relatively inexpensive, lightweight, strong, available, colorful, and easily machined. With some glue and bolts keeping them locked together, discrete use of LEGO bricks is entirely appropriate in competition robots. 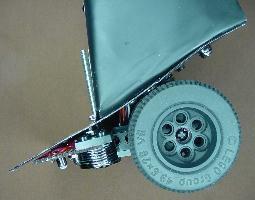 Bugdozer’s scoop is made out of thicker aluminum stock, as the motors are mounted to it and the scoop takes the brunt of collisions. The front-most portion of the scoop (that touches the ground) is shaved (beveled) slightly to discourage an opposing robot’s scoop from getting underneath Bugdozer’s scoop. Bugdozer’s tires are wide, hollow, soft-rubber slicks (LEGO Technic #6594). Thin, solid tires like on Boe-Bot have such poor traction that Boe-Bot just spins when trying to move Bugdozer, even if Bugdozer is completely turned off! The matching hubs (LEGO Technic #6595) were painted black to avoid detection from the sides. 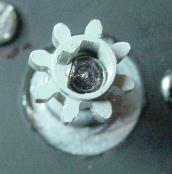 The smaller gears are pushed onto the motor shafts, which they fit by shaving the normally “+” shaped center into a “D” shape. Bugdozer’s body panel is very thin aluminum flashing. The panel needs only to encase the guts (wires) and mount the object sensors, therefore thicker material would be a waste of weight. The sides have been painted stealth-black to avoid detection by another robot. The front of the body panel and the scoop remain shiny and very attractive, because it’s desirable to have the opposing robot attack where Bugdozer’s scoop and wheel force are most effective. Connectors are used throughout the design. 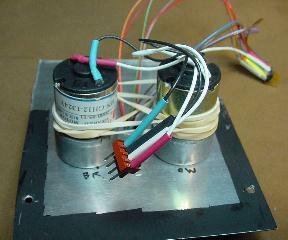 This allows the motors and sensors to be easily disconnected from the motherboard. 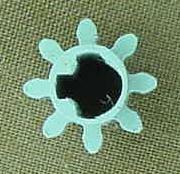 One pin is cut from the 10-pin male connector to key it, and the matching pin on the female receptacle is filled. “Keying” prevents the connector from being incorrectly attached upside down. I’ve disassembled and reassembled this robot dozens of times. The small effort spent on making connectors has rewarded me every time. Nuts, bolts, and washers complete the structure. The nuts are Nylon locking, thus reducing the usual loosening of standard nuts by motor vibration, locomotion, and collisions. 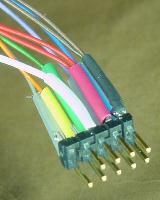 Pink acrylic latex covers some solder joints and exposed component leads to prevent shorts. The latex can be peeled off more easily than glue if desoldering or other work becomes necessary. 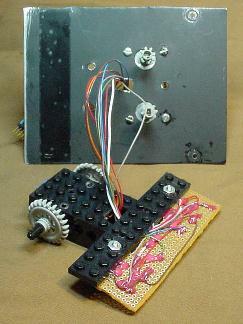 Rubber bands maintain tension on the motors to keep the shafts pressed against the wheels.